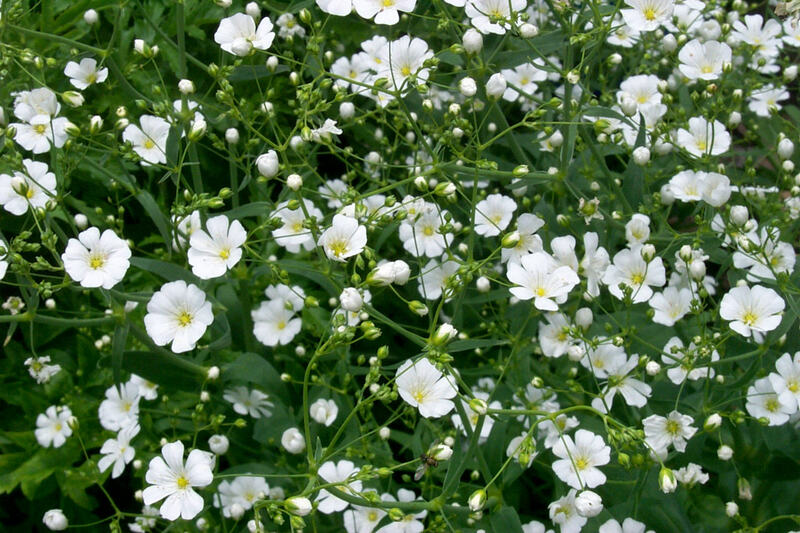 Gypsophila is grown to provide material for flower arranging and to provide a welcome contrast to the colourful large blooms in the bed or border. Sprays of small, starry flowers appear above the small, grey-green leaves – the slender plants should be supported with small twiggy branches. Gypsophila thrives best when there is some lime or chalk in the soil. VARIETIES: One species is grown – G. elegans. The white-flowered strains belong to G. elegans alba, and the most famous is ‘Covent Garden’. ‘Monarch’ is rather smaller (15 in.) and colours other than white are available. Pick G. elegans rosea for shell pink flowers or you can buy a multi-coloured mixture – from this you will obtain white, pink, rose and crimson flowers. SITE & SOIL: Any well-drained, non-acid soil will do – choose a sunny spot. PLANT DETAILS: Height 1-1 ½ ft. Spacing 1 ft. Flowering period June – September. PROPAGATION: Sow seeds in September or April where they are to flower. Thin to required spacing.